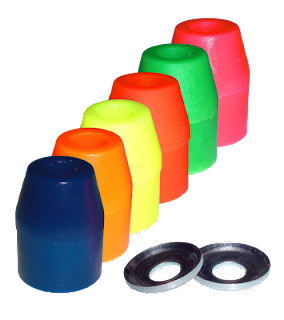 Longboarding Blog: Venom Bushings Just Landed!! Take a look at these Babies!! Now you see them soon you won't. Get them now. Everybody is talking about these puppies. Super good rebound. They Feels so fine like walking a bed of gummy bears. We don't recommend that you eat them though. Good for Randal, Paris, Chargers, Bombers, Bears, and Fastracks.